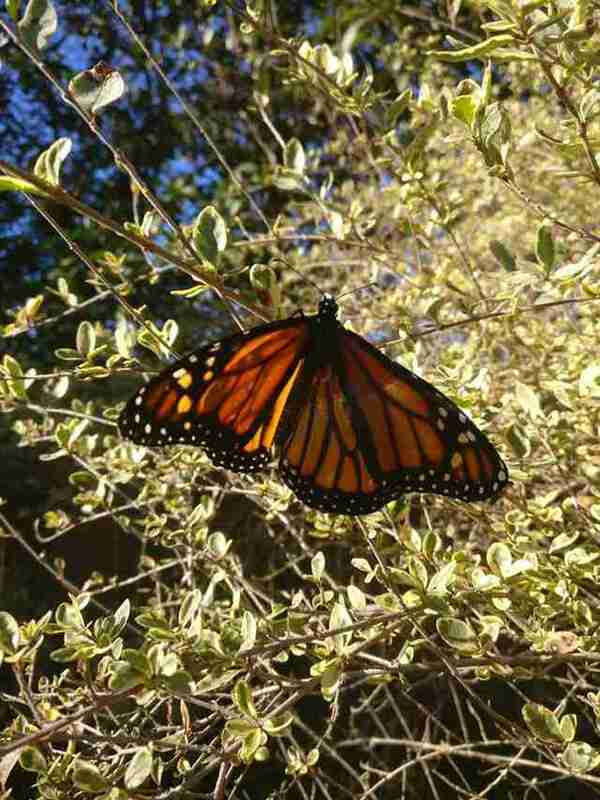 Few of nature's perfect creations are quite as endearing as butterflies. But Romy McCloskey has a good reason to cherish them more than most. Sadly, Romy lost her mother to cancer several years ago. 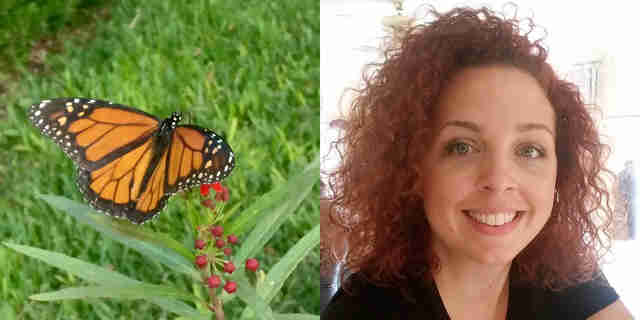 Before she passed, however, her mom reassured her that her spirit would linger on after. “She told me, ‘Romy, don’t worry. Whenever you see butterflies, just know it’s me checking in on you to let you know I’m OK, and that I love you,’” Romy told The Dodo. But rather than merely depend on encounters with butterflies, Romy has since taken it upon herself to make sure the world has more of them. Whenever she finds caterpillars in her garden, Romy brings them inside to grow and metamorphosizesafe from predators and other threats. Then she lets them go. 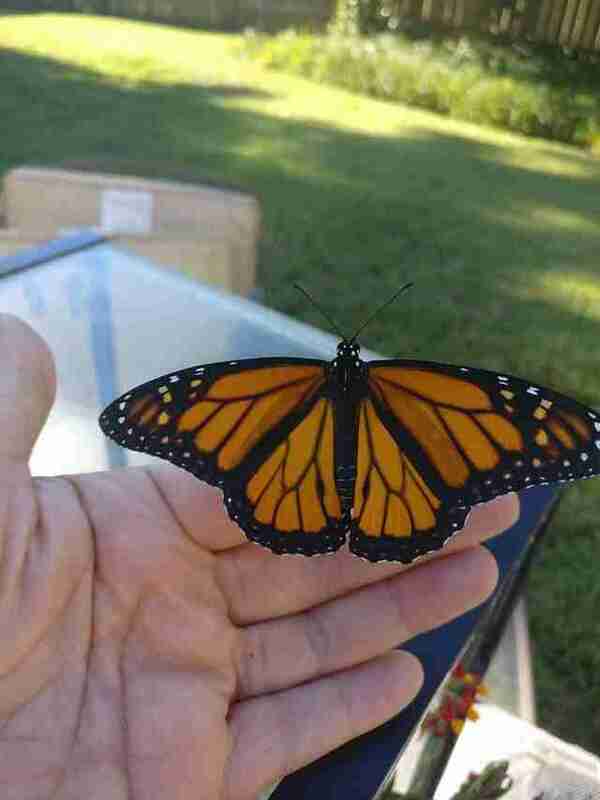 Romy has successfully raised and set free dozens of butterflies. 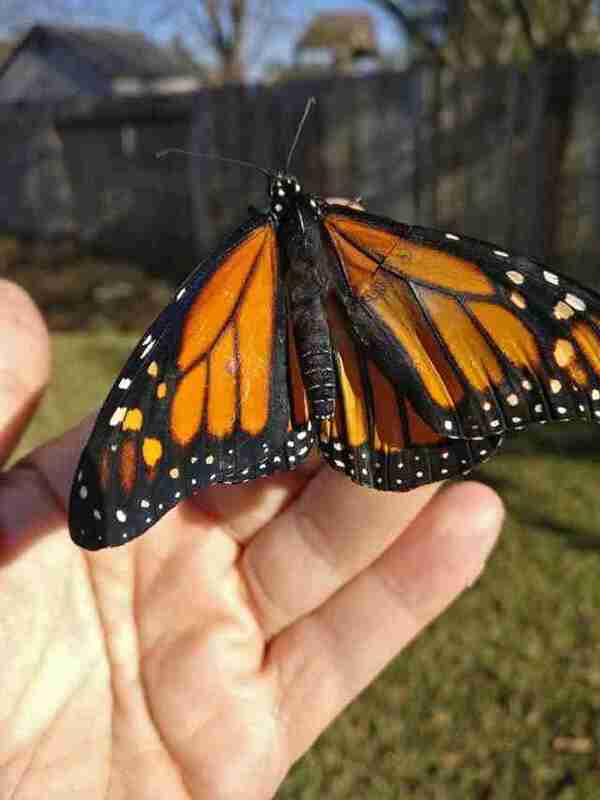 But recently, one emerged from his cocoon needing an extra helping hand. 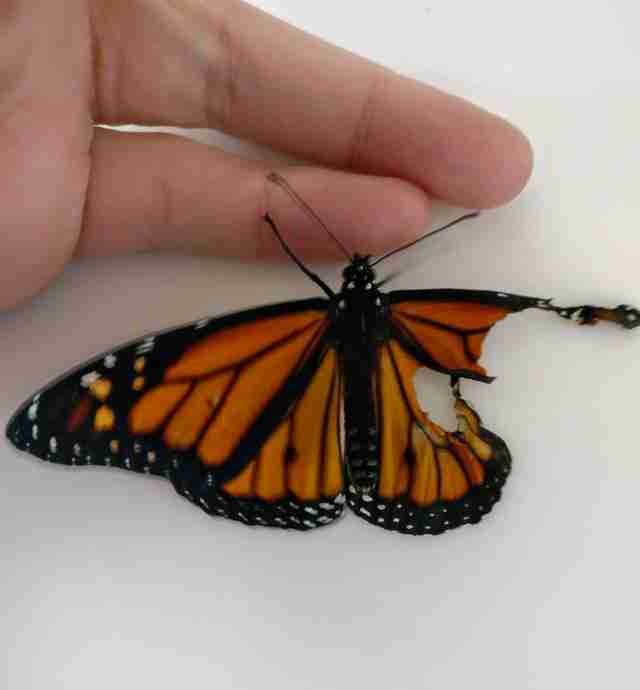 This butterfly's upper and lower wings on one side had come out torn. 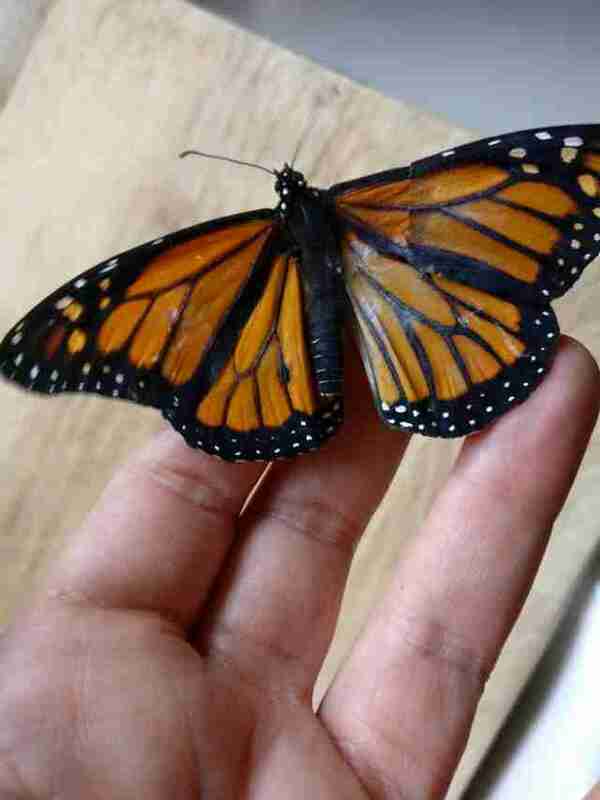 Although he was otherwise healthy, that malady meant he could never fly or survive on his own. "I couldn't bring myself to put him down," Romy said. "I figured I would keep him inside and feed him until he died." But then she got another idea. 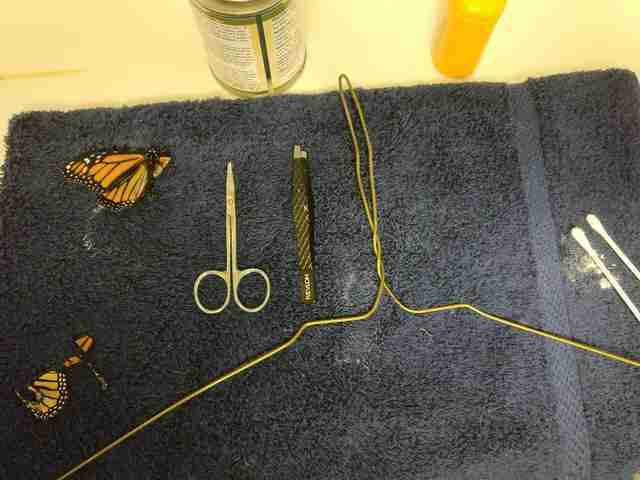 A friend of Romy's learned about the situation and sent her a guide for repairing butterfly wings. So she gathered the things she'd need: a towel, wire hanger, contact cement, toothpick, cotton swabs, scissors, tweezers and talcum powder. 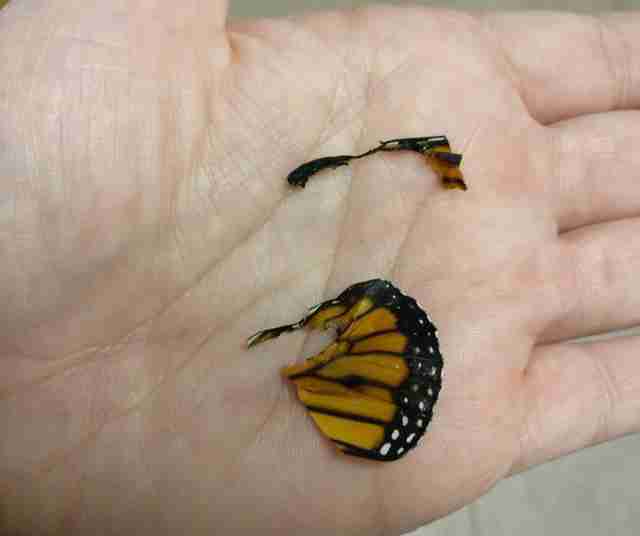 Romy had kept the body of another butterfly who did not survive. From this she'd craft a transplant wing. 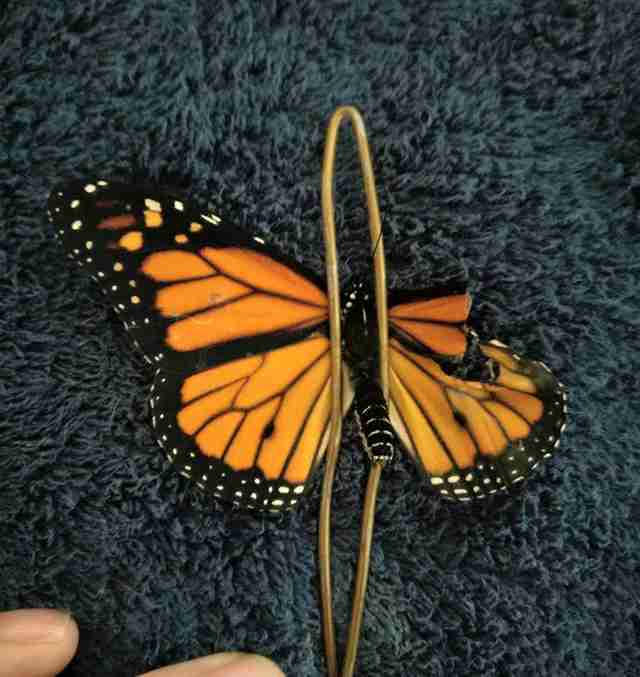 Gently securing her delicate patient between a loop in the wire hanger, Romy then carefully cut away the damaged portion of his wings. Though this might seem like a painful procedure, it's actually not. Trimming damaged wings to make repairs is rather like getting a haircut. Next, using as much care and precision as possible, Romy glued pieces from the transplant wing into place with the contact cement. Once secured, a few sprinkles of talcum ensured that any unwanted stickiness around the edges would be lessened as it dried. With that, the butterfly was looking almost good as new. 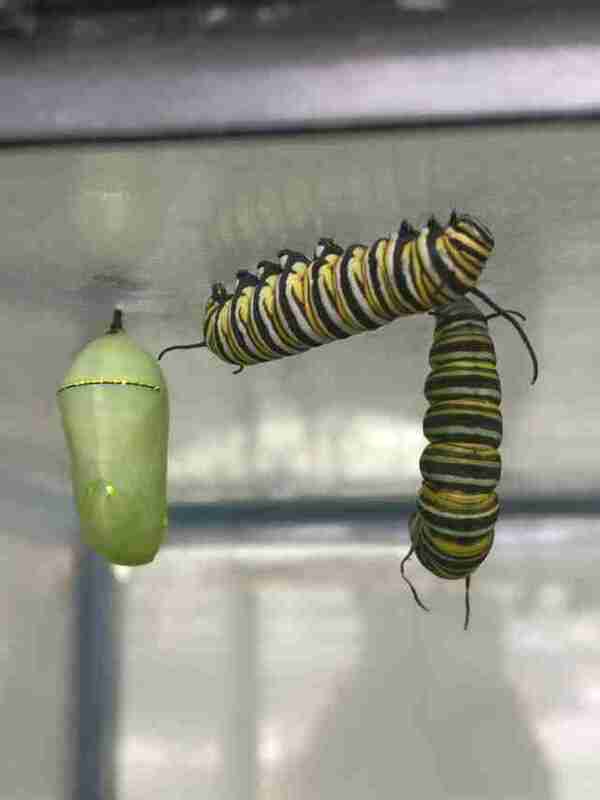 Following a day of post-op rest, and a hearty meal of nectar provided by Romy, the butterfly's big moment arrived. Outside for the first time, he got to use his new wings. "I was nervous for him, but encouraged him as one would their child learning to ride a bicycle," Romy said. "I was amazed and relieved to see him make his first lap around the yard." After that initial lap, the butterfly then alit on a branch. "When he landed I thought I'd have to take him back in," Romy said. "But just as I was about to reach for him, off he went and kept going. I felt really happy. And happy doesn't adequately describe it. I have no other words. I soared with him for sure." Butterflies will always have special meaning for Romy because of the comfort they bring to her — so it's only fitting that she give them something back in return. And in so doing, the world is made a more beautiful place. "With each one I release, I tell them I love them and wish them luck on their journey," Romy said. "To watch such a thing grow and transform in front of your eyes is pretty incredible."